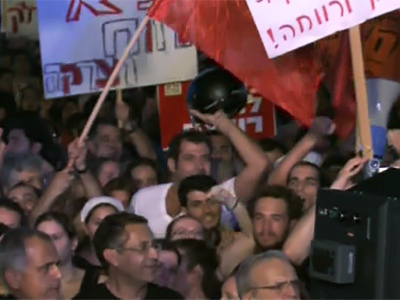 Discontent in Israel is showing no sign of abating, with hundreds of thousands of people protesting in Tel Aviv. One square has already been dubbed by some as the “Israeli Tahrir,” drawing parallels with the Egyptian revolution. Saturday night’s anti-government protests, among the largest ever, were staged in Tel Aviv, Jerusalem and a number of cities around the country. Some 300,000 people are expected to take part, and there is a heavy police presence. Tonight’s protest follows controversial housing legislation which was passed recently by the Israeli parliament. Protesters say it allows only the wealthy to buy houses, putting affordable housing out of the reach of ordinary people. A post on the protests organizers’ website urged Israeli Prime Minister Benjamin Netanyahu to “be part of the change,” the Associated Press news agency reported. On Friday, representatives of the protesters gathered to discuss key issues for the upcoming demonstrations, the Israeli newspaper Haaretz reported. They decided on a set of key demands to be put forward, which include “fair division of resources,” a welfare state and social justice. Some activists demanded that the protests should voice direct opposition to the current government and the prime minister, the newspaper reported. Some protesters are raising political issues, hoping to attract more attention to the Arab population in Israel. Ines Ealias, a co-founder of''Tent No. 48'', an organization campaigning for equal rights for Israel's Jewish and Arab citizens, says they do not believe in social change without addressing the issue of the rights of Palestinians in Israel. 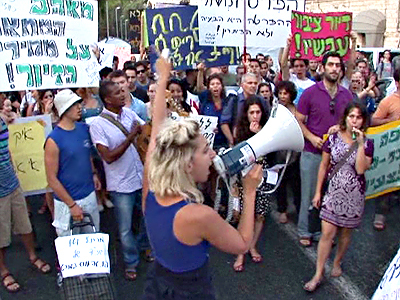 The demonstration in the capital was concentrated on a central boulevard in Tel Aviv. Some of the protestors drew comparisons to Egypt and Cairo’s Tahrir Square, where the revolution took hold. The boulevard’s median has been turned into a tent city, where people hold discussions, eat and sleep. This protest, mostly by youth, has not turned violent, and the protest’s organizers vowed to keep the affair peaceful. 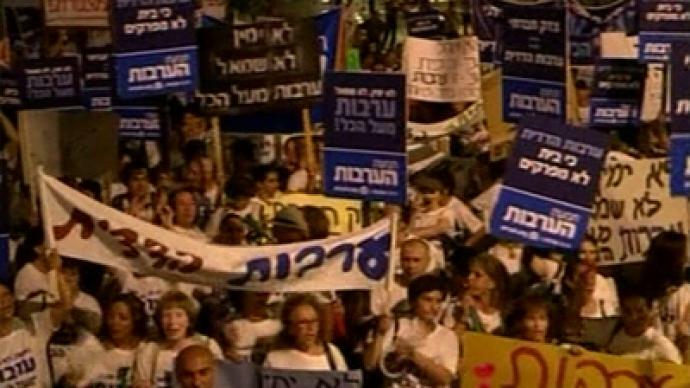 Despite some parallels, the Israeli rallies are very different from the protest movements in neighboring countries, Daniel Ben-Simon of Israel’s opposition Labor Party told RT. 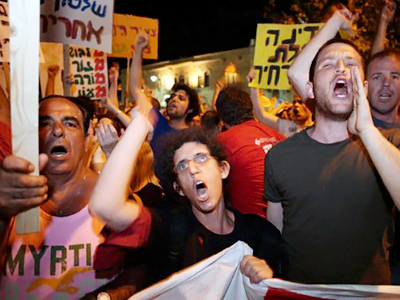 According to Daniel Ben-Simon, the Israeli rallies are protests by professionals fighting for a better life. This weekend marks the third week of protests in Israel, but the country’s Prime Minister Netanyahu has still not voiced any reaction. 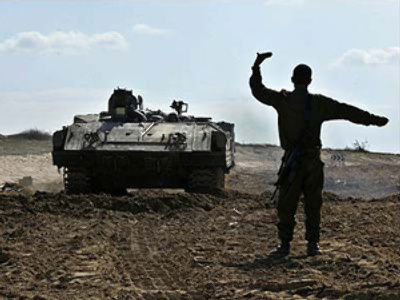 Yariv Oppenheimer, Director General of the Peace Now organization, says the prime minister may pay a high price for turning a blind eye to the situation. 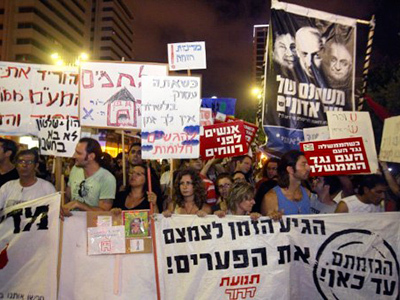 ­The ongoing wave of Israeli rallies grew from a small protest in Tel Aviv in July demanding lower real estate prices. Since then, the movement has progressed to mass campaigns demanding social reforms. According to the AP, last Saturday’s nationwide rallies drew crowds of about 150,000.